Susan's Disney Family: Mickey Mouse Clubhouse Quest for the Crystal Mickey releasing on Disney DVD on 5/21 #Giveaway! 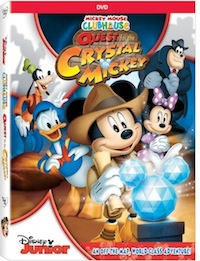 Mickey Mouse Clubhouse Quest for the Crystal Mickey releasing on Disney DVD on 5/21 #Giveaway! The generous folks at Disney Junior, are giving one of Susan's Disney Family readers a chance to win a Mickey Mouse Clubhouse Quest for the Crystal Mickey DVD. Would you like to win? Please let me know who your favorite character from the show is? There are also other ways to enter, please enter below. You can purchase this great dvd at Amazon or in stores now. Minnie Mouse is the fave here. Our favorite is Donald Duck. My favorite is Daisy Duck. My favorite character is Donald Duck. my character that i love is clarabelle, because she is so interseting, always doing new things and making up things to do. quite silly honestly. my favorite character is clarabelle, because she is funny, intersting, and always doing and making new things.